All of this happened in the middle of nationalizations, with PDVSA as the most important, through which the Venezuelan State takes control of the oil, consolidating Venezuela as one of the main exporters of crude oil as they took advantage of the high prices of the last decade. It is a messy process. There is no social experiment in its pure form. In this context, the popular communes coexist with the army, Chavista communes with a certain level of independence, militant sectors working class with different levels of support to Chavismo, with millionaires who had enriched themselves at the expense of the people and through corruption. There are always traditional bourgeoisie who have shown some interest in Chavismo to adapt to the new situation and take advantage of it. The majority of them are willing to turn to the other side when their stingy interests tell them to. In essence, it is against this self-management and forward-motion from the real Popular Power – from below – and against the accomplished conquests, against that general anti-capitalist and anti-imperialist feeling, that the dominant classes of Venezuela have stood against, along with the Yankee imperialism, where the government of Trump, just like Obama’s, has been playing a role through international pressure and a specific economic blockade. They have taken advantage of a situation in which the Chavista government has suffered some level of important popular discontent because of its inability to solve essential problems such as food, medicines and a brutal raise of the cost of living. The right wing, the bourgeoisie and the imperialist mechanisms in action have deepened the crisis in every way and have even created and recreated this situation. All of this happens at a time when the Venezuelan government has also completely minimized its connection with those from below who supported it. These Communal Councils work on the basis of neighborhood assemblies, where they set out demands, but also organize to set several tasks and develop social work and the infrastructure of the neighborhoods. These communes were created as of 2009 and were developed by Chavez before his death to be the lead agency of the revolution, in a self-governed and self-managed way. In his discourse, he talked about independence from the State and political parties, even the Chavista party. We see, therefore, that the Popular Power in Venezuela, initially pushed by the charismatic Hugo Chavez, has been in a constant tension with the State, the party in the government, the Bolivarian bourgeoisie, the Army and all of the caste of bureaucrats that have found a position in the State and grabbed a little piece of power and oil revenue. From above, resources have been cut, and they have hindered, in every possible way, the development of Communes and the Popular Power, because the growth of this experience implies, by itself, a strong contradiction with the State and the dominant power. This is a conflict that will not be solved peacefully, with no traumas, no ruptures, as many theorists would like. On the contrary, as history shows us, class conflicts and interests, when a process emerges from below with popular power, are resolved through violence. Chavismo is not really aligned with this line of rupture with the capitalist system. Without a doubt, for the putrid Venezuelan right, things had gone too far. After the failed coup of 2002, little by little, the right rebuilt its forces and has returned for its privileges after Maduro took office. Strikes, shortages produced by the bosses, among them the owners of Polar – a group which involved in food production – among others. On the heels of the popular discontent, the right gets a majority in the National Assembly. There, it will try politics and techniques of destabilization and pressure in order to oust President Maduro. Thus, ultimately, it intends to oust the Chavista regime. “Personalities” of this Assembly belonging to the MUD (Mesa de Unidad Democrática or Democratic Unity Coalition) tour the world and maintain contact with political leaders and coup-supporting organizations from the US and Europe, willing to play the most interventionist card as possible in Venezuela. 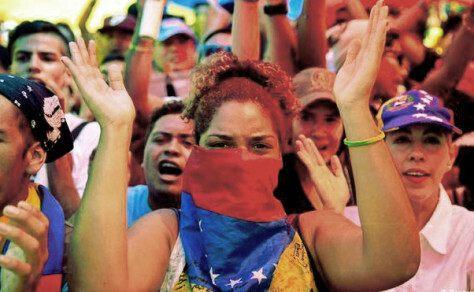 The American support for the destabilization caused by the Venezuelan right has been total. There have been many imperialist organisms which give economical support to the coup-inducing actions carried out by the MUD. The CIA of the United States funds these actions through different organisms such as the National Endowment for Democracy, a secondary agency which diverts funds of the CIA toward different NGOs and groups promoting boycotts and the isolation of Venezuela. They call for “democracy” but they have no “democratic” component, and with the excuse of demanding “Human Rights,” they try to destabilize the political and social situation of Venezuela. This is a task that these groups carry out systematically in all of Latin America and which adapt to the current situation. Let’s take Provea as an example, which is an NGO linked to the issue of “Human Rights”, and is funded by organizations such as the Open Society Foundation – which belongs to multimillionaire and financier George Soros – Ford Foundation, the embassy of the United Kingdom, the European Union, among other embassies and different groups. Probably, the European Union is worried about the Human Rights of the Venezuelan people and other Latin American countries, but not about the millions of immigrants that arrive on their coasts enduring painful misery, as a product of the wars they have caused in Africa and the Middle East, after having looting such territories for over two centuries. Also, politically what has been developing in Venezuela now for years is in fact nothing less than the same plan carried out in Chile to overthrow the government of Allende in 1973 and to impose the fierce dictatorship of Pinochet, or to defeat the Sandinista Revolution in Nicaragua during the 1980’s. Of course, it is a plan that needed certain adjustment according to the historical context, but it is the same model. The resemblance even attracts the attention. Finally, the election was called for the National Constituent Assembly. For its composition, several social organizations were called in a timid way to be part of the assembly. In spite of the limitation of their participation, the popular organizations revitalized their action in pursuit of this integration. There are indicators that these felt once again considered in the ongoing project, which gave new birth to some hopes and provided certain social life to those who felt somehow distant. Even though they made some criticisms, they carried out activities in favor of this constituent organization. Maybe thinking that once under its wing they could achieve some favorable social effects and some corrections. This political and economic crisis, backed by the coup-monger right-wing and by the US, had another response. It seemed like the Venezuelan people in general were not mobilizing, that they didn’t find the way to restrain this coup-mongering surge, but in the regional elections of last October 15th, the popular majority “spoke” and rejected, in their own way, the right-wing and the coup-mongering, which resulted in the victory of the Chavista candidates in 17 out of 23 states. The people spoke in the elections, although not in the street and resumed activities of Popular Power – which is what ultimately matters – but without a doubt, this is an indication that something from below, something in the popular structure was developed, is there and is expressed. There is a subjectivity at a popular level, with confusing and contradictory elements, it’s true, but indicating that “something” of this Popular Power lives and functions. “Something” out of all of this experience is there, fresh, alive and demanding, still without stumbling, its space and place in history. In the elections, the right wing could not prove there was fraud or anything like it. They were left without solid ground, but the truth is that the Venezuelan people chose this peculiar way of making themselves heard and trying to maintain the essence of a process in which they have a voice, although today it seems to be expressed in a contradictory, messy and, at times, false way. Therefore, “something” of this popular prominence, ideological elements – the production and distribution of goods, the self-defense of communities – are present and it is not mere propaganda. It is clear that these elements should take action in a complex and, for now, hardly favorable context. Nevertheless, “something” out of all of this process has a hint of reality. There are people in Latin America that dream and take action in order to build “something” different from the society we live in. That “something” may evolve in one way or another. It depends on the popular support from below and on Latin American peoples to make this “something” become a strong popular path to achieve real Popular Power with no tutelage from the State; and with a socialist horizon in its sights. Furthermore, when the right wing comes to take it all, when the most imperialist power of the world intervenes to bury even more what they consider their “backyard”, we can’t hesitate about what side we are on. It is not about the defense of this or that government. For the anarchists of the FAU (Uruguayan Anarchist Federation), the center of the debate is how the peoples of Latin America can move forward toward our complete emancipation and liberty and how we create strong peoples and move toward the development of Popular Power. This entry was posted in Commentary and tagged anarchism, democracy, revolution, venezuela. Bookmark the permalink.